Outdoor play time is always the best time. Kids love getting together and having fun. Outdoor play time is also an essential part of a child’s learning and can help build on their vital life skills. At Aarons, we are committed to providing children with safe and educational play equipment that will nurture and develop these important skills. So here are some great play ideas using Aarons products to help the children in your care learn through fun. We all know how much energy younger children have, and swinging is the perfect way to calm and relax them. Physically, swinging develops gross and fine motor skills through repetitive leg motions. Actions such as gripping help arm/hand/finger coordination. Swinging is also great for social development as it promotes cooperation and sharing as there are usually plenty more children than swings available! Lastly, Swinging can promote imaginative play, encouraging creative thinking. Make swinging more fun by making a tower of cardboard boxes and see who can swing the furthest and kick the boxes down! Or every pre-schooler loves superheroes, so get them laying on their bellies on the strap swing with legs and arms in the air and try to grab a toy or ball from the educators hand by swinging higher. And don’t forget to hide and seek. Get them to close their eyes, give them a push counting to ten and then see how fast they can find you. See how fast they can re-focus. Kids love to climb, it’s second nature to them. Therefore, it is important that these skills are built upon from an early age. But kids need to be challenged enough to help develop their natural intuition for protecting themselves during risky play. Aarons Up & Over climber offers many learning benefits. The rock wall develops hand-eye coordination by challenging children to work out the most logical way to the top. The Net Rope component (also included on our Cargo Bridge & A-Frame trestle) adds an extra challenge by training children to balance and focus on their spatial awareness. Climbing up is also great for upper body strengthening, which is difficult to achieve with pre-school children. See who can hang onto the monkey bar/ladder the longest. Or get the lowest under with Limbo ladder. Best of all, make an obstacle course out of some Trestles, Up & Overs, and bridges, add some timber planks and ladders and throw in a time trial. You’ll have the kids sweating it out to win in no time! Slides are a great way to build confidence and promote physical activity; they’re a fan favourite for kids! No child will settle for just one go on a slide, so they’ll also get a LOT of exercise from repetitively scaling the fort or cubby. This activity also helps kids to improve their balance, coordination, and spatial awareness and will train their bodies to move a certain way. Slides also promote social skills such as negotiating and communicating when deciding who gets the next go! A slide can be a rocket propelling in the air, or army personnel jumping from a helicopter. Who can go the slide on their tummy, or side, even backward (safely of course!). And there is always a willing Fireman to slide down a Pole. In fact, who is the strongest fireman who can hold onto the pole the longest or climb up the pole the highest? Aarons has plenty of equipment to help a child’s mind flourish. Imaginative play helps with emotional and social development through the act of sharing and grappling with various feelings and thoughts. It also benefits self-esteem by giving children a world of their own that relaxes them, and can even provide them with skills they’ll use later in life, such as teamwork and creative problem solving. When you have a Train, Speed Boat or Pirate Ship in your play space, games really are optional as their little, busy minds will take over! But if you want some ideas, why not make some steam streamer sticks and conductor hats. And don’t forget to man the ticket stall, with pretend money of course. Who’s going to be the maintenance man who must climb into the tunnel to fix the broken engine? Did someone say sharks & pirates? Problem-solving games like Noughts & Crosses is a great way to teach kids step-by-step logical and strategic thinking skills. By incorporating colourful spinners it makes the activity more appealing and adds to the fun. See which kids can win 2 games in a row. An Abacus Frame will encourage basic mathematical learning. Maths can be difficult, especially at a young age, so an Abacus can assist by providing them with a visual aid to help solve their counting problems. What’s more, our multi-coloured abacus balls are visually appealing and help when the game is all about counting only certain colours. Or use the abacus to count how many games of Noughts & Crosses have been played. 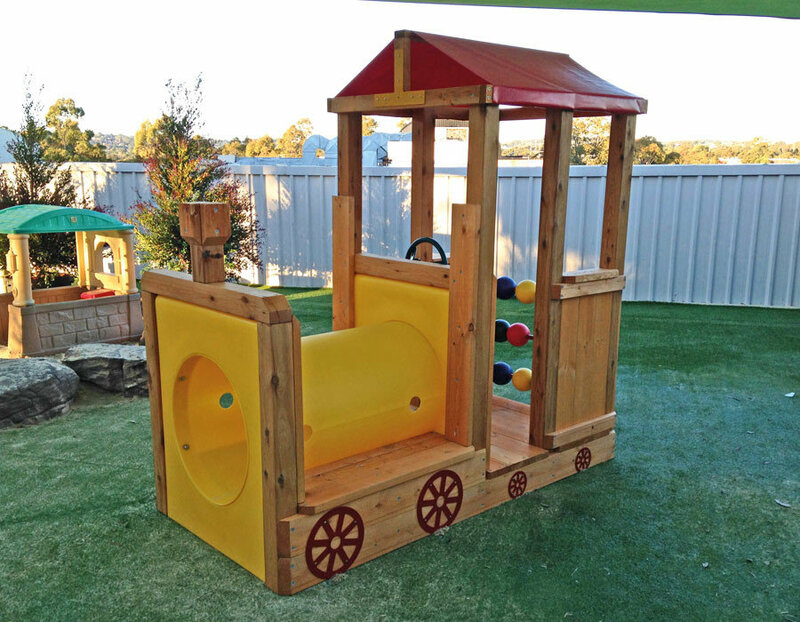 All of these products and more are available from Aarons Outdoor Living and are on display in our superstores across Australia; let us transform your early learning centre playground into an area where imagination and learning thrives!